NGP PLASTIC ABEE designed, tested, developed and now produces the new EasyPack packaging to fulfil the new requirements of its customers. Speed, economy and sophistication in the packing room since lids and punnets are produced simultaneously. Also, PET film is available in the natural clear colour or with the option of a clear lid and coloured bottom. 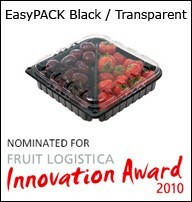 The advantage of the transparency of PET film and the largest possible flat surface of the side walls and the lid offered by EasyPack products (European patent pending) provide the best possible display of the packaged fruit. The range of EasyPack products (punnet and lid together) offers standardised packaging, practical stacking, allows for automated packaging and above all reduces the storage and transport costs because it consists of 2 products in 1. Thanks to the continuity of the EasyPack products, the lid fits easily on the punnet and clasps completely tight, excluding any possibility of the product coming into contact with other products on its journey from the producer/packager to the end consumer. A combined system of reinforcement of five different areas of EasyPack products functions concurrently and produces high level mechanical durability of the packaging in continual or periodical column and cross stacking. This is thanks to the multiple rigid articulations of the lid which are combined with the peripheral rigid wedges of the bottom, with the help of the vertical nerves located around the four corners of the side walls and the specially designed stabilisers that connect the lid to the punnet of the particular package.